Please provide a description of your property. The text (150 words maximum) you provide will be the actual text placed in your listing. Information may include number of rooms and baths, rates, methods of payment, etc.. Contact information and address are not included in this word count. Situated on the shores of Lake Champlain on historic Isle La Motte, Ruthcliffe Lodge commands a panoramic view of the Green Mountains of Vermont. Our secluded island paradise makes the perfect summer getaway or fall side trip. Only one hour from Montreal, Canada and Burlington, Vermont, it is also the ideal stopping place en route to these destinations. 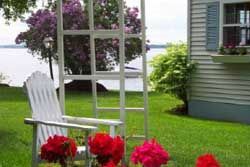 Ruthcliffe Lodge features six lakeside guest rooms with unparalleled views of Lake Champlain. Rooms are uniquely decorated in themes characteristic of the region. Each is comfortably furnished and features such charming details as hand-stenciled walls, handmade wall quilt, wicker chairs, and a Vermont-marble verandah overlooking the shores of the lake. Private bath and ceiling fan included. 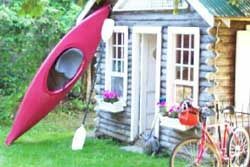 This and other Lake Champlain Bed and Breakfast Inns can be found here online in The Register.